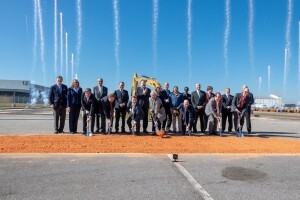 With a crunch of shovels and a volley of fireworks, Airbus employees and executives, state and local officials, and airline industry representatives broke ground on January 16 on a new A220 Final Assembly Line in Mobile, Alabama. Located just feet from the existing A320 FAL, the new facility will employ hundreds of workers and begin delivering aircraft to customers next year. It brings Airbus’ investment in the state to roughly $1 Billion. CEO and Chairman for Airbus Americas, Jeff Knittel, said the partnership with and investment in the Mobile area is consistent with the way the global company does business around the world. “Our partnerships are growing again with the addition of an A220 manufacturing facility that will employ some 400 more employees at full rate. Together we’ve already put Mobile on the map in the world of global aviation, and together we are making a new mark for the future,” Mr. Knittel said. Representatives from Airbus suppliers and customers alike expressed excitement over the addition to the company’s footprint on the Alabama Gulf Coast. JetBlue Vice President Ursula Hurley said the A220 is a part of her company’s strategy to satisfy customers while containing costs. “The A220 not only provides the most comfortable cabin in its class, but also offers incredible efficiency. At JetBlue, we are proud to have selected the A220 to join our fleet because we continuously strive to offer our customers a superior product while also looking to reduce cost,” Ms. Hurley said. Delta Senior Vice President Greg May said the airline looks forward to taking delivery of one of the first aircraft to come off the new line. “The worldwide Delta family of 80,000 professionals is proud to have been the U.S. launch customer for what we consider to be the game changing A220 aircraft. We’re particularly excited to take delivery of our first A220-300 from this final assembly line, here in Mobile, next year, Mr. May said. In his remarks to the crowd of 600, Airbus CEO and Chairman Tom Enders traced the history of the relationship between Airbus and the Mobile area. The company first invested in a Mobile facility in 2007, establishing its Airbus Engineering Center at a location near the current final assembly line. Since then, that center has paid $180 million in salaries and donated more than one half million dollars to charitable organizations in the community. Alabama’s Gov. Kay Ivey, Mobile Mayor Sandy Stimpson, and Mobile County Commission President Connie Hudson each pronounced the close partnership between Airbus and the community and state a success. Mayor Stimpson said the new A220 line will put Mobile in elite company among aircraft manufacturing centers. “With the addition of the new A220, Mobile is poised to do something that no one could have dreamed about. With the production of the A320 and A220, Mobile will become the fourth largest commercial aviation site in the world,” Mayor Stimson said. Alabama Secretary of Commerce Greg Canfield said Airbus’ expanding presence in Mobile will spark significant job creation and spur additional aerospace investment in the region for many years to come. 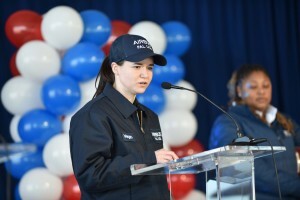 Representing Airbus employees, Megan Large highlighted the opportunities the new A220 line will provide for those, like her, who’ve made a career in aviation. Justin Lieber, a student at UMS-Wright, spoke about his own aspirations and the benefit of being able to follow his aviation dreams in his hometown. Senators Richard Shelby and Doug Jones, as well as Rep. Bradley Byrne addressed the gathering by video. Airbus began manufacturing the A320 family of aircraft in Mobile in 2015 and has since delivered more than 100 aircraft to eight customers.